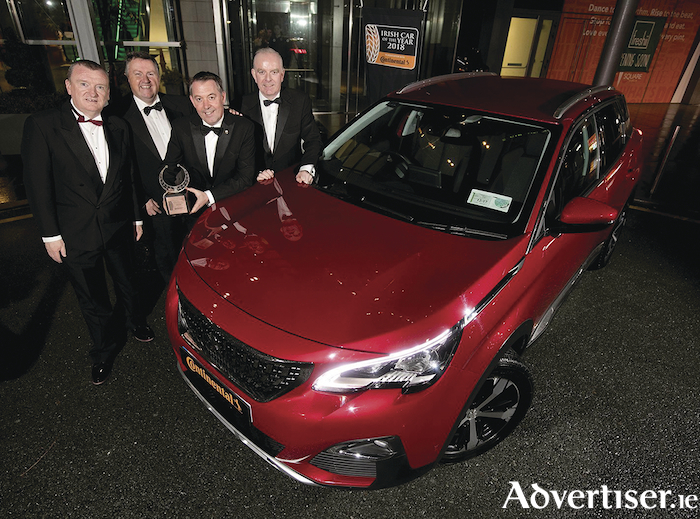 The Peugeot 3008 has received the top accolade in Irish motoring this year, winning the Car of the Year at the annual awards evening. The 3008 was crowned the overall winner for 2018, in addition to being named as the Irish Compact Crossover of the Year category winner. Motoring journalists hosted a gala black tie event attended by Ireland’s leading car brands, importers, distributors and other motoring dignitaries. New for this year’s awards programme was an award designed to recognise outstanding innovation, the ‘Irish Car of the Year Innovation award’. The aim of the award is to highlight the many innovative technologies and systems that car makers are integrating in new models. Many of these innovations are helping to improve road safety and are making cars more intelligent as the dawn of autonomous driving comes ever closer. The winner of the inaugural Irish Car of the Year Innovation Award for 2018 was the Honda Civic Sensing Suite of safety features. Apart from the innovation category award winner, the nine other category winners were all in the running for the top honour with the judging panel of some 30 journalists electing the Peugeot 3008. Chairman of the Irish Motoring Writers Association, David Walshe, said it was a "very tight competition this year with many, many fine vehicles in the running for the Irish Car of the Year accolade". Tom Dennigan of Continental Tyres said the choices of the Irish Car of the Year jury are a great help in informing Irish consumers as to the bewildering array of high tech vehicles that are launched in Ireland each year.